Making a House a Home: I love my slow cooker!! I don't know about y'all, but I LOOOVE my slow cooker (or crock-pot, whichever you prefer to call it). Not too long ago, I discovered A Year of Slow Cooking. Y'all GO CHECK IT OUT!!! She's got some seriously yummy recipes on her site AND she created a cookbook, too!!!! And if any of y'all try her recipes out, let me know how they turn out!! YES, I love my slow cooker too. I've always called it a crock pot, and mine is almost on it's last leg so I'll be replacing it soon. Thanks for the slow cooking recipe site, I'll be checking that out. I love the Year of Slow Cooking website. I've made about a dozen of her recipes and all turned out great! Slow cookers/Crock pots make the best roast. 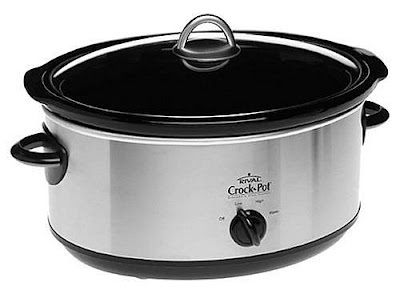 I love my Crock Pot, too, and I have the same one featured in your post. YEA, congrats on that super cooker! I have been using my old US one here in Croatia for years and finally, after 10 years I have found one here. I was insanely surprised.